The Clinch Mountains, within the Appalachian's, offer one of the most beautiful settings on earth, and as a guest in one of our cabins, you'll find yourself surrounded by majestic beauty and quiet mountain solitude. Bristol Motor Speedway is within a 45 minute driving distance from our cabins. 1. 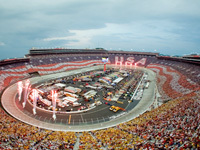 Buy Your Bristol Race Tickets here! 2. Shop Our NASCAR Superstore. 1. Hosting plans start at $3.99 mo.